I would like to begin by asking you to imagine the following scene, I would ask you to close your eyes, but you also need to read! So imagine with me; a Monastery dating back to 1812 grand in nature, on the corner of the French Quarter of New Orleans, with seven private courtyards, glass lanterns, exposed brick, and original wooden beams stretching the length of a chapel rich with history. If only these walls could talk, you can feel the history as you walk through every space in The Monastery. Let me now lead you to a room with the whitest of walls, and light filled spaces made to convey spirituality and scenreity. A space where keeping things simple, clean and elegant is a must, anything too over the top would take away from the sanctity of the space. This is a venue where you let it do most of the work for you. As a planner I am just there to fill in where needed, and at The Monastery, what is needed is very minimal. When entering, I could see this bride here; the guests arriving in sharp tuxedos and shimmering gowns, through an entrance lined with candles and greenery and a harp playing on the front lawn. 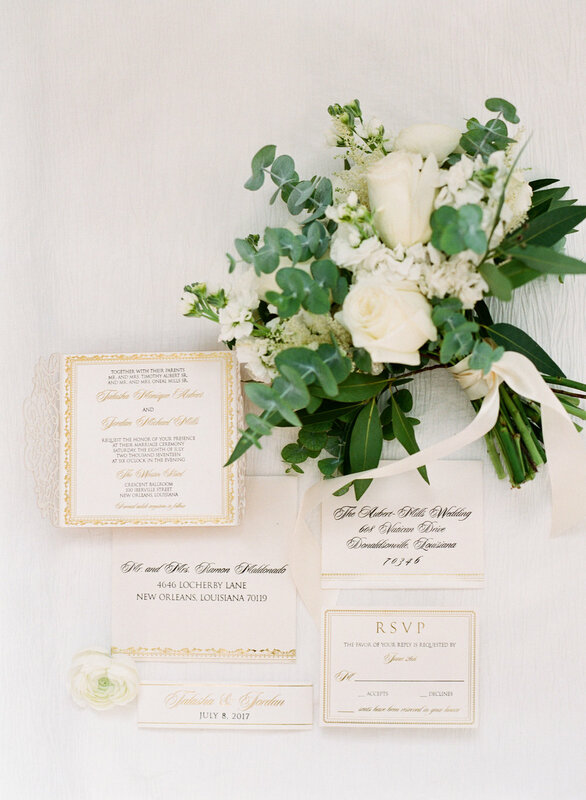 Every guest is met with gold rimmed champagne flutes filled with a soft brute or sweet rose to set the tone for this celebration, a coveted invitation only held by a select few. As the bride and groom make their way to the dance floor, I can hear a jazz ensemble accompanying the likes of Robin Barns, singing “Unforgettable,” in a way that only a solo voice can make you feel in love with the moment. The right accents can make the biggest impact. 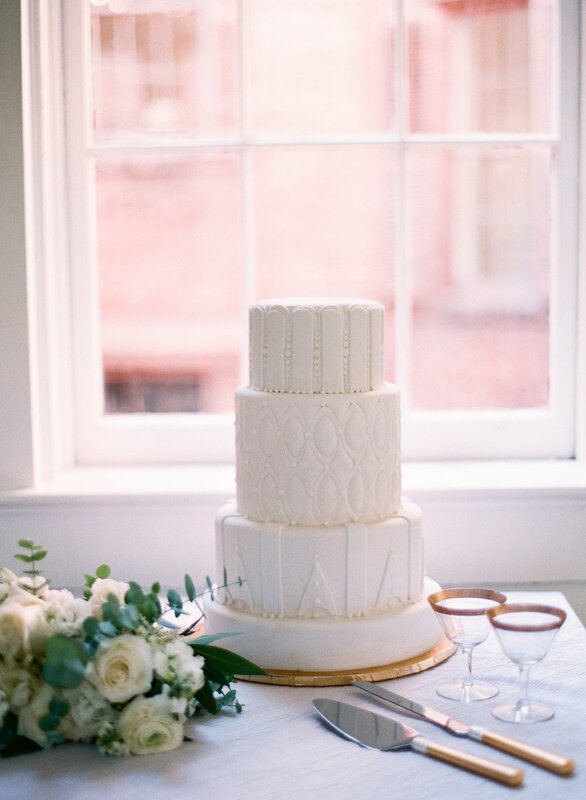 I picked only one for this styled shoot; I wanted to keep things as simple and elegant as possible. Against the crisp white purity of the venue, I choose a metallic; gold. If you keep your elements simple it allows for a bit more flexibility in areas such as floral and other design elements. Symmetry is noticed; but not talked about. I work with my clients to discover if they want to create conversation in design elements, or allow for the conversation to flow from the experience we create through entertainment, food and celebration, this guides me in two very different directions when making choices on behalf of my client. Less elements means less areas to adversely impact the continuity of your event. Surprisingly enough the more detailed you get in your theme or brand, the more attention to you have to pay to those design details so the continuity is apparent and easily picked up on by your guests. Therefore by keeping the elements at this venue classic, simple but yet impactful. I had to balance a tipping point; not too over done, but not disposable cutlery or over the top decor. With intentional choices such as tablescapes; which I allowed for more on the table, in turn limiting wait staff having to clear and prepare each setting for multiple courses, I could have all of it be part of the design of the room. Accented with gold and greenery I hoped that each table would provide for friends to gather and share in the experience. 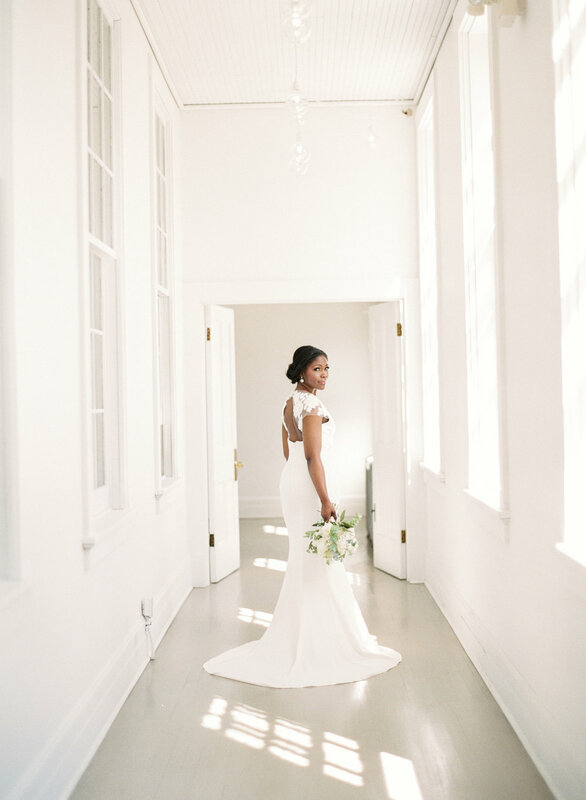 With this styled shoot I kept the experience at the forefront of all my decisions; with the inspiration coming from the abundant historic value of The Monastery as well as the beauty that the bride brought all on her own. I could not have picked a better dress for this bride if I had one day or one year. It is simple, clean and elegant. Only standing at 5’4” the front piping of the dress elongated her silhouette, with leading lines from top to bottom. With more of a broad shoulder, the cap sleeve and detailed floral lace, allowed to soften the shoulder and allow for just enough skin to compliment the conservative but dramatic deep vee, which could be worn with modesty. 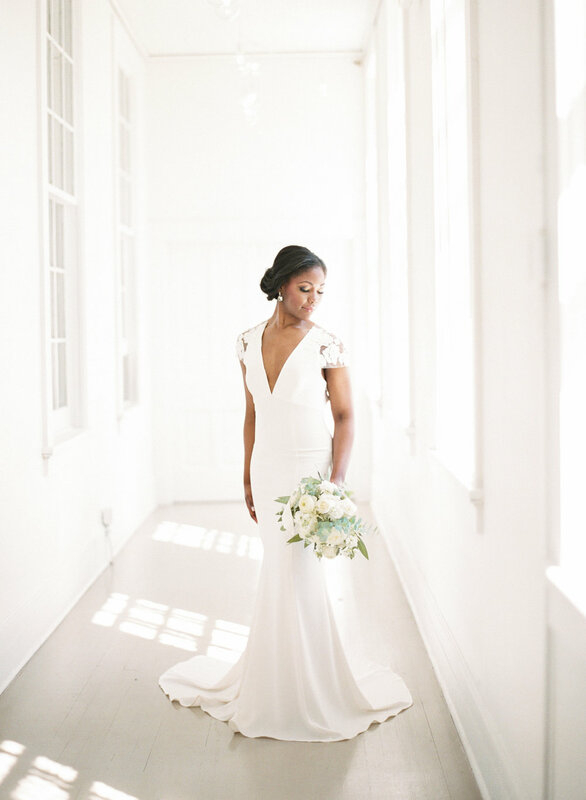 The hair, pulled up of the neck, to again compliment the back detailing of the dress also allows for the bride to stay comfortable during the heat of the day in a city such as New Orleans. The guests end the evening with a neatly tied box of three macaroons from Sucre, delicate and light but a sweet reminder of the of the sophisticated and memorable event they just attended. Tis the season for engagements! More proposals take place between November and February, than any other time of year, so as we embark into the thick of it, here are a few pointers for the proposer. As I recently had a hand in the proposal planning for my very first friend (Jessica) when arriving in New Orleans many years ago, Brian reached out to me for a number of reasons; mainly due to the fact that I could put a plan in place where Jessica would have no idea what was about to happen! I put together a list; although it doesn’t need to be followed to a T, it can allow for some guidance and help to ease the stress that may surprisingly creep up on you for this momentous occasion. 1. Making the Plan - It seems obvious; but you will need to craft a story that won't tip off the proposee. Make it believable enough, but also not something that they would cause further investigation. Enlisting the help of friends or family is not a terrible idea, as long as they can keep a secret too! Consider crafting a scenario where the level of attire will match the type of proposal you are executing, especially if you are documenting the event with either a photographer or videographer. Diaz NOLA Photography was abe to effortless capture the moment for Brian and Jessica and the timing was fantastic as the Omni had holiday decor throughout the hotel making it even more magical. 2. Selecting the Vendors - The top three vendors that I would consider including are; a photographer / videographer, music and rentals (for props); a candle lit balcony, a flower path entrance, a cued balloon drop or even firework display to celebrate the YES! 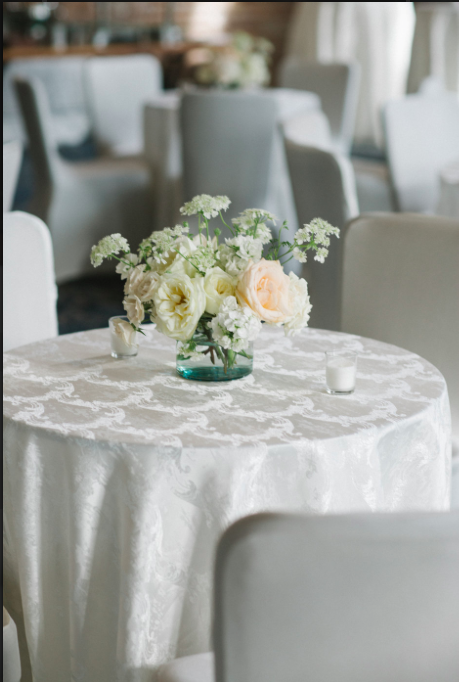 These vendors do not need to be those that you choose for the big day; just ones that know what you are working to accomplish and can have the flexibility to keep it simple or expand to as elaborate as your imagination can go! “Can’t Help Falling In Love With You” on the violin filled the room as Harry Hardin from New Orleans Classical and Jazz played Brian and Jessica’s song. 3. Picking the Venue - Again, this does not have to be where you are going to get married or where anyone else has gotten married for that matter, and in fact does not need to be seen on the jumbotron, unless that’s your thing and you have an in at the Superdome! To make this an extra special moment pick a location that is representation of your courtship; where was your first date, or first kiss? Is there a museum you frequent together or a shared secret that could translate into a venue. 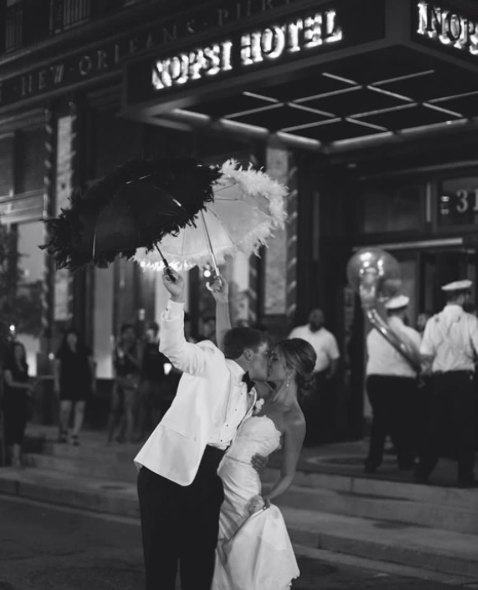 Brian’s choice for location was the Omni Royal - New Orleans; as it overlooked the Mississippi River, where he and Jessica had their first date! 4. The Ring - You would be surprised how easily this can be overlooked! My suggestion is, keep the ring in a safe place; not in a coat pocket, as there it can easily be left in the closet when you pick another coat! Also work with your jewelry to insure your ring is polished, cleaned and ready to role on the big day, as often I find that proposers select and purchase the ring a bit in advance of the actual proposal day. Ramsey’s Diamond Jewelers will even hold your ring until you are ready to propose, then you know it’s safe! 5. Preparing your Statement - Do not hesitate to write it down! If you have something to say, and you want to be sure it is said, writing down your thoughts is exactly what you should do. I would strongly recommend practicing a time or two before the actual event, and remember to keep whatever you wrote down. The most genuine thing you can say in these moments are exactly how you feel, and if it isn’t like you to make a speech, don’t. “I love you and I want to spend my life with you,” that’s all that needs to be said in a moment like this. I set Brian up to already be on one knee for Jessica’s arrival; I wanted to make sure this step wasn’t missed and Brian was a bit nervous that I had my suspicions this step would be missed with all the excitement between the two of them. 6. Including VIP’s - Weather you want special people to be present at the proposal, or waiting in the wings to come out after the “YES,” this is a detail that can make a proposal more of an event for the proposee. Make sure VIPs know the plan for the proposal, and provide them with a signal for their entrance so you are able to either time it perfectly for a surprise, or to allow for enough time between you and your partner to enjoy your moment together. Have your VIPs dress appropriately for either pictures or the after proposal plans that are in place. You know the VIPs best, and there isn’t anything saying you can’t fib about the reason you are gathering them together as well, especially if they might spill the beans to the proposee! 7. After Proposal Plan - Most of the focus usually ends up on asking the big question; however there is a lot to celebrate after the main event! With after proposal plans in place you can easily continue the celebration and include more friends and family, or lead your partner on an adventure highlighting your courtship, the possibilities are endless, and this is usually the time when you the proposer can take a breath and enjoy the moment. Brian and Jessica are two of my closest friends and I could not be more honored to not only assist with the proposal and be witness to the event; but also I get to begin planning their big day and the ideas I have are endless for this special couple. Stay tuned; that will be one you won’t want to miss! Again, happy engagement season to all of you, it is a very special time of year! Often it’s a combination of the both, one maybe more one than the other, however these principles are based trust that is developed between myself and you, the client. With little direction from Mark or Whitney other than a few keywords; dramatic, simple, focal points, inclusive and vampire chic, I was able to connect the dots and put together a day that embodied them as a couple. This did not mean that Mark and Whitney did not have input on the day; however the trust they were able to place in my expertise allowed them to breath easy and enjoy their union. Despite weddings following a similar cadence; there are a multitude of ways a couple is able to infuse their style in the days events. From color to themes; this day - of all days - should be a display of personal style. That being said; it isn’t uncommon to feel as though there are things that have to be done at a wedding or a way in which the day should go, and falling into a line of thinking; “well everyone else does it that way, I guess I should too.” Not the case, I am seeing spins on traditions, different ways of doing the “typical,” and many people scraping conventional all together! 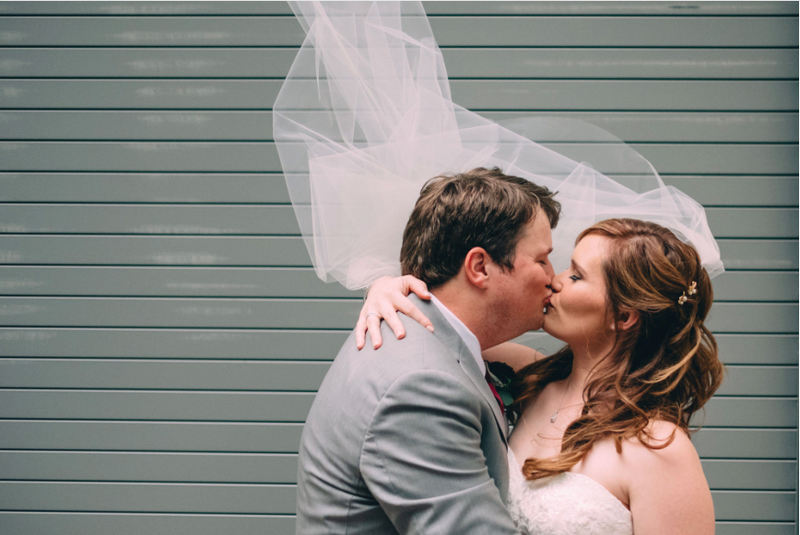 From the moment I met Mark and Whitney I knew their day was going to be anything but typical. From the food, to the music, to reception seating and venue; I saw creativity and personality in every choice these two made for their day. It began with The Civic Theater hosting the ceremony and reception, this space, although not typical for a wedding, was transformed into a dramatic, candle lit night scape. In existence since 1906; The Civic Theater has evolved as New Orleans has grown, watching over the city, filling with memories as crowds of people have entered the doors to share in the diversity of performance offerings. From vaudeville, burlesque, musicals, and disco, The Civic Theater has entertained and hosted many. Remodeled in 2011 with extraordinary attention to historic detail and appropriate updates for hosting a multitude of events this space was a blank canvas for Mark and Whitney’s wedding. When selecting this type of space everything, right down to the rugs are customizable and a choice you may have to make, a total allowance for free will and creativity. Overwhelming to some, but with this couple, they had a vision and followed through with ease. 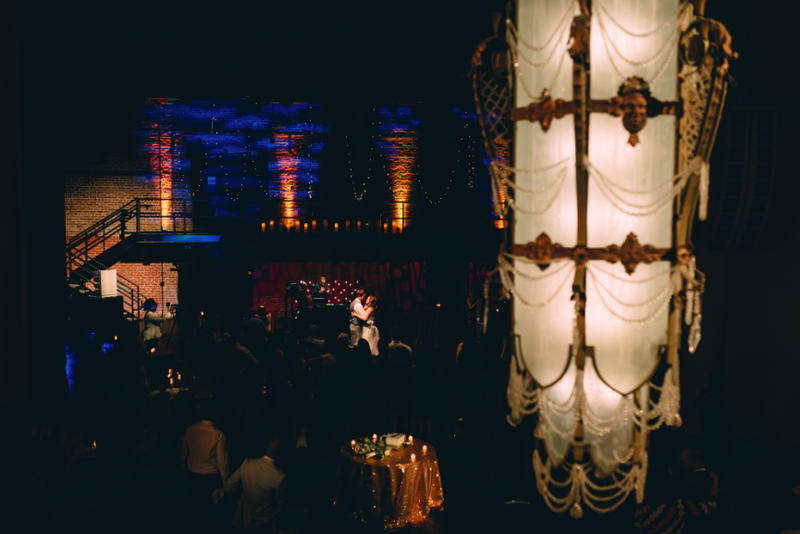 Taking Vampire Chic to a whole new level; with candles in every corner, uplighting that allowed to enhanced the dramatics of the tall ceilings, brick work and ornate theatrical details of this New Orleans landmark. When an event is uneventful; meaning that everything goes as planned, set up is easy, vendors follow through and everyone has a good time; I can see the look on my clients face and it means the world to me to know they are stress free and enjoying the day with their family and loved ones. Mark and Whitney had smiles on from beginning to end and I could not have been happier to orchestrate their wedding day. With the venue as the host, the vendors shined through at this event. No one wanted to leave the dance floor with DJ Aaron Lane Entertainment, however when they did, they were met with unique food truck / street food choices from; Two Girls One Shuck, Theo’s Pizza, Fete au Fete and Imperial Woodpecker Snoballs and the Civic slinging drinks all night. Couples hope when selecting that special day; one out of 365, that perfection will follow and all things will come together. As a planner I stray away from optimism, and try to think of everything. Often staying up late strategizing on plan b; negotiating with the florist, the caterers, the venue and others so that you don’t have to. Working on the fly to switch gears and execute the event with minimal disruptions. If there is one piece of advice that I can give my clients it is: panic does nothing to change the outcome of your event and this is so important to remember. Repeat this through the planning process, make this your mantra, heck, let’s monogram it on some napkins if that helps! Trust me, if clouds start looming, a vendor falls through, or God forbid, a wardrobe malfunction occurs the day of or even the week before your big day; don’t panic; go to your planner, explain your concerns and sit back while we work to ease the anxiety. It’s very likely we already have a plan for what you are thinking of! Nearing the eve of Ashley & Brian’s big day Hurricane Harvey was predicted to make landfall on the Louisiana coast. Weather predictions aside; Ashley kept calm, her preparedness allowed her to focus on what was really important; the union between her and Brian, all the family that came together and the future that would follow with Brian by her side. Ashley and Brian were lucky enough to be the first wedding with new owners at Masion de Macarty; a Bed & Breakfast. After receiving an extreme facelift; this staff proved to be an ease to work with. Our teams were tasked with turning the ceremony configuration into the reception space with a 20 minute time limit. It was all hands on deck in the 100+ degree heat, setting up a 100+ seated dinner arrangement all the while, changing the floor plan in response to unforeseen issues. Despite the things that could have gone wrong and were out of this couple’s control; that wasn’t their focus. Their demeanour, trust in each other, supportive family and reliance on me as their planner, made their special day come together flawlessly. With the culmination at the end of the night the wedding party, guests and family, jumping in the pool, celebrating with style! Talk about an unplanned event, but worth a lifetime of memories. The honoring of Veterans holds a very special place in my heart; as my Grandfather, Father and Husband all served in the military. There is something about defending the freedom and rights of those you do not know and may never know that is beyond admirable. Finding a way to give back is extremely important to me. As a member of the American Legion Auxiliary, it doesn’t always feel like enough. My time can fill up quickly with consultations, site tours, events and so much more. I am sure we can all identify with our lives filling up quickly and passing by in a blink. I like to remind myself that “having” the time versus “making” the time is a critical difference, and the very least I can do when it comes to serving those who have served for me. With Spanish Oak Events, I offer a military discount as a gesture, that while it does not compare to the risk and sacrifice made on a service members behalf, I hope that it signifies my gratitude. Please mention your service when contacting me in regards to your event. Looking to give back to Veterans today or in the future? The National Veterans Foundation has important information to consider so your efforts are well spent and directed appropriately. 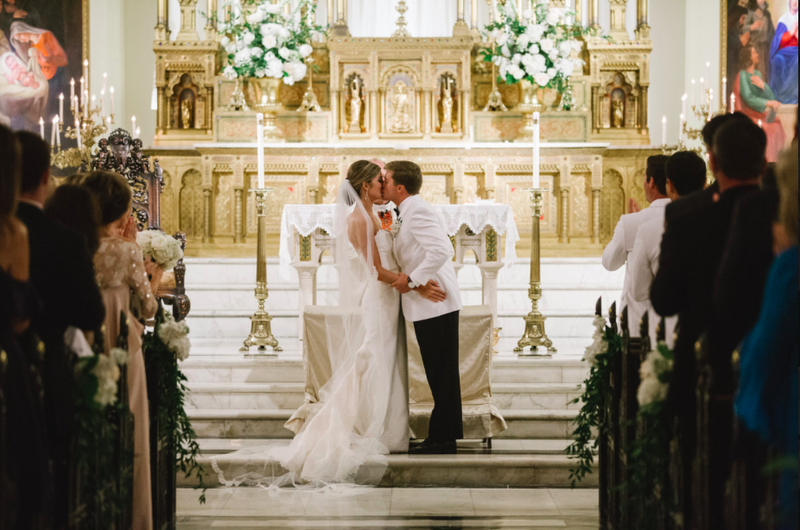 In regards to your wedding, there are a few ways you can directly or subtitling showcase you or your partner's service.Inside Weddings has a fantastic information regarding military accents and traditions; LINKED HERE is the full article, it’s worth the read! A few of my favorites that I have executed at prior weddings are shown in the pictures below, along with my favorite Veterans. 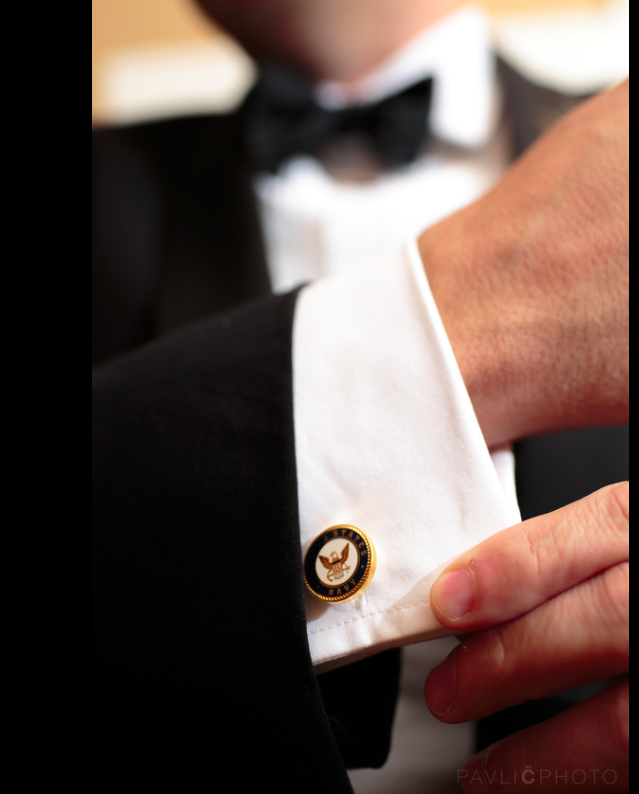 The smallest of details can make the biggest of impacts; these Navy cufflinks were worn by the groom; a veteran wanting to subtly pay tribute to his time of service. Not every detail has to be loud or noticeable by everyone; small choices such as these add to the continuity of the theme and can have special meaning to only those that are aware. 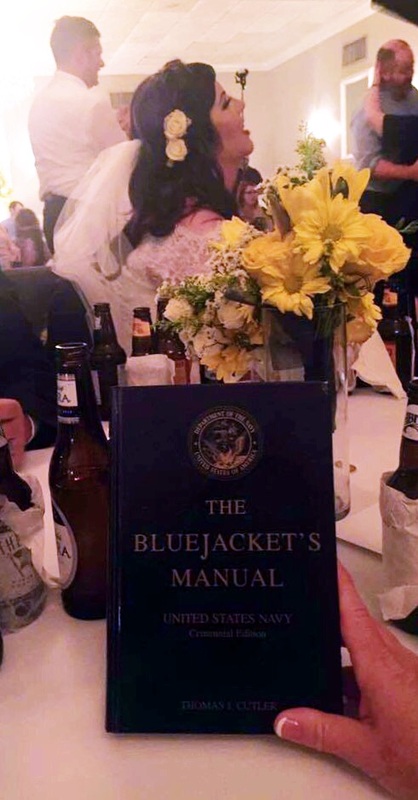 In a recent wedding, The Bluejacket’s Manual was used for a groom whom had served in the Navy. The tradition shared at this event was the passing of The Bluejacket Manual from a current Navy wife, to an incoming Navy wife; a special token that can be on display for years to come with multiple meanings to both spouses. My brave Father, right before heading to Vietnam. My brave Husband and his Father. As this picture was damaged from Hurricane Katrina, this photo captured him right before heading to Desert Storm. My Father In Law also in the photo, always encouraged his son to join the military as he is a Vietnam Veteran as well. My life long friend Chris (far right) whom I've always called brother. I proudly share he has done 5 tours of duty for his country. Last week I had the great pleasure of attending a luncheon; LGBT Weddings: Insight and Opportunities with Bernadette M. Baillie of TheKnot.com and co-hosted with the New Orleans chapter of NACE; National Association of Catering and Events. Let me begin by saying how lucky I was to sneak in on this event and sit with some of the best of the best in New Orleans events. It becomes more clear the longer I am a “member” of this community that working in the world of events is the best job I could have ever asked for! 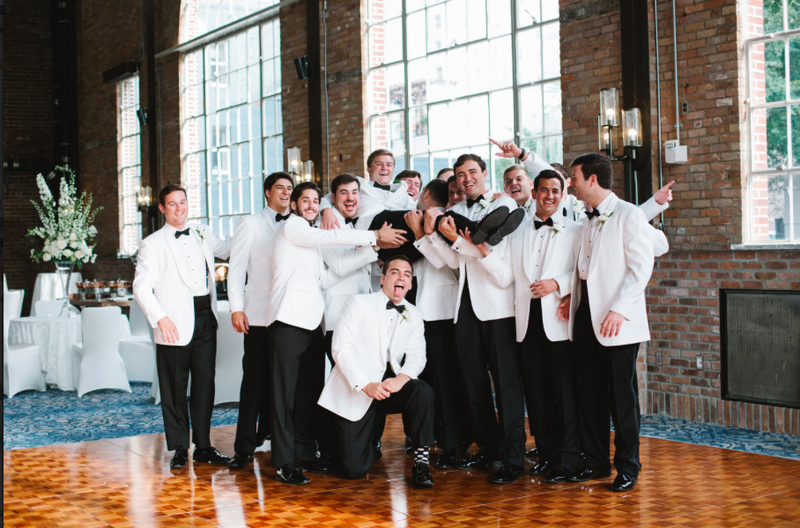 The focus of the day’s events was the support of the LGBT community when planning a wedding. I walked away with a notebook full of ideas and a spring in my step as I have a few weddings coming up that really are going to benefit from what was presented. Already thinking about themes and how important it is for my clients to infuse their personal style in this special day; I have been collecting my thoughts on what it means for a couple to “brand” their event. Social media provides a great deal of inspiration for ideas; Carey Lowe @TheIdeaEmporium specializes in branding weddings and has truly been an inspiration for me; follow her immediately! Branding an event is more than just color palettes or personalize name tags. A brand can represent something special between you as a couple; obvious or subtle, but ultimately showing up in a variety of ways that contributes to the continuity throughout the entirety of the experience. I like to ask more questions that help me understand why you love what you love and want it represented on this special day. From baseball to nintendo; it is possible to tastefully infuse themes into an event and create an overarching experience. Taking an example from Carey Lowe check out this Instagram post about her custom cocktail that was tasteful in multiple ways. Here is what I suggest you begin to think about to make your theme transform into a brand that will then ultimately allow us to create that unique experience shine through for you and your guests. While there is a difference between a literal vurses an abstract interpretation of your desired theme; I edge more towards interpreting your theme and infusing it a variety of unique and subtle ways. Selecting a venue that nods to your brand or holds a special significance to you as a couple. Mixing a signature cocktail to be served to your guests. Vendors that can interpret your brand through a dish or the entirety of the meal. Create a new tradition or a tradition with a twist. Making your day special can take many forms; buck tradition, interpret elements in different ways, focus on the entire experience from beginning to end; let’s try something that hasn’t been done before! Trust me, I’ve got a few secrets up my sleeve that I will only share with you!